Pobblebonk Readings is a set of shared reading materials for the early years that encourage children to read and repeat words along with the teacher and that lead to independent reading. It sets out to provide a series of interesting reading materials that incorporates the phonic principles in high-interest texts with a good balance of non-fiction, fiction and real-life contexts. Special care is taken to accommodate the needs and interests of reluctant readers, particularly boys. The series seeks to ensure success in reading and writing in the critical early years through the explicit teaching of phonics while using authentic, meaningful materials. 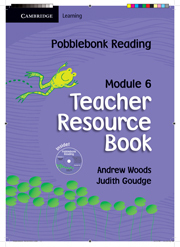 Pobblebonk Reading has 10 modules of texts. Each module has 10 books of varying page extents ranging from 8 to 16 pages. Overall, there is a gradual increase in the complexity of the texts across the modules.